The American Academy of Pediatric Dentistry recommends that children have their first dental visit by their first birthday or when their first tooth erupts. Many new parents are surprised to learn that dental checkups should start so early, but it really is an important part of their development. It’s also when we will have the best opportunity to identify any potential issues with growth of the soft palate and jaw bone. It may not seem like much right now, but small issues can turn into significant costs down the road if you continue to delay your child’s dental care. Does It Really Matter with Baby Teeth? This is a very common question that many parents ask themselves, and it’s a question that is easy to understand. After all, their children are going to lose those teeth anyway. If the kid isn’t in any particular pain, doesn’t that mean it will be okay to put off the dental care? The simple answer is that no, it’s not a good idea to put off dental care just because they’ll eventually lose their baby teeth. The reason is simple. Dental problems in your child’s teeth go beyond simple cavities. If they’re not addressed as soon as possible, a lot of very small problems could get worse – and cost you a lot more money in the long run. Of course, this is about more than money. If a cavity is caught while the decay has only reached the enamel or the dentin, it can be repaired easily enough, and minimal discomfort. If the decay reaches the nerve tissue at the roots, though, it may require a root canal or other therapies to eliminate the decay and put a stop to the pain. Research has shown that the prevalence of cavities in primary baby teeth is a lot more significant than most people think. It’s estimated that 42% of children between the ages of 2 and 11 have had cavities in their primary teeth. On top of that, it has been estimated that 23% of children in that same age demographic have untreated cavities. There are several potential reasons for this, and if these teeth remain untreated, they can go on to require serious treatment in the future. You’ve probably heard it often enough, but the simplest solution to avoid these problems is to make regular checkups an integral part of their dental care. This gives us an opportunity to provide routine cleanings and examine their teeth and surrounding tissues to make sure there aren’t any serious problems building up. These regular visits are also important in their young days to help them make good oral hygiene an integral part of the rest of their lives. A lot of children will feel anxiety over visiting the dentist. This is very common and very natural. However, it’s not a reason to let them miss out on important dental care You, as the parent, can make a huge difference here. 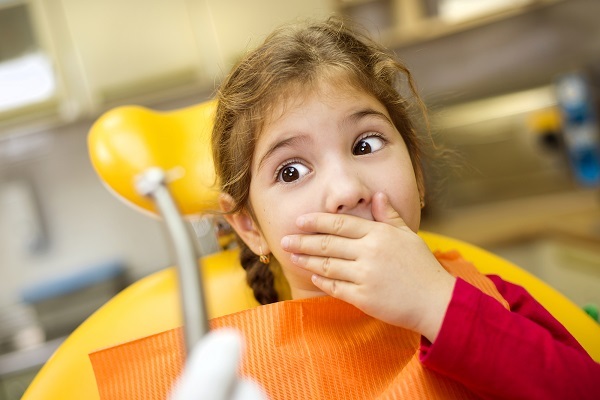 If your children see you trying to avoid your own dental appointments, that kind of anxiety can easily transfer to them. On the other hand, if they see how readily and regularly you go and get a dental checkup, it can help calm some of their anxieties and help them see exactly how important and completely non-scary a dentist visit really is. Contact us today to set up an appointment for your child and make sure that they get the ongoing dental care they need.